Visits to far away dentists are a thing of the past. You can now receive quality and affordable dental care with personal attention in your Kondhwa neighborhood at our clinic which is located conveniently at Sunshree Woods Commercial Complex, Shop No. 2B, NIBM Road, Kondhwa, Pune 411048. Nearest landmarks are: Behind IDBI Bank in Sunshree Woods Commercial Complex, Near RIMS International School, NIBM Road. Please click here to schedule an appointment or go to the contact us page for more contact details and driving directions. Dr. Prachi Patil's Professional Dental Care practices a full scope of general and cosmetic dentistry with expertise ranging from porcelain veneers to dental implants, crowns and bridges. Dr. Patil can now correct a wide variety of so-called permanent cosmetic dental problems, and can literally redesign your smile. 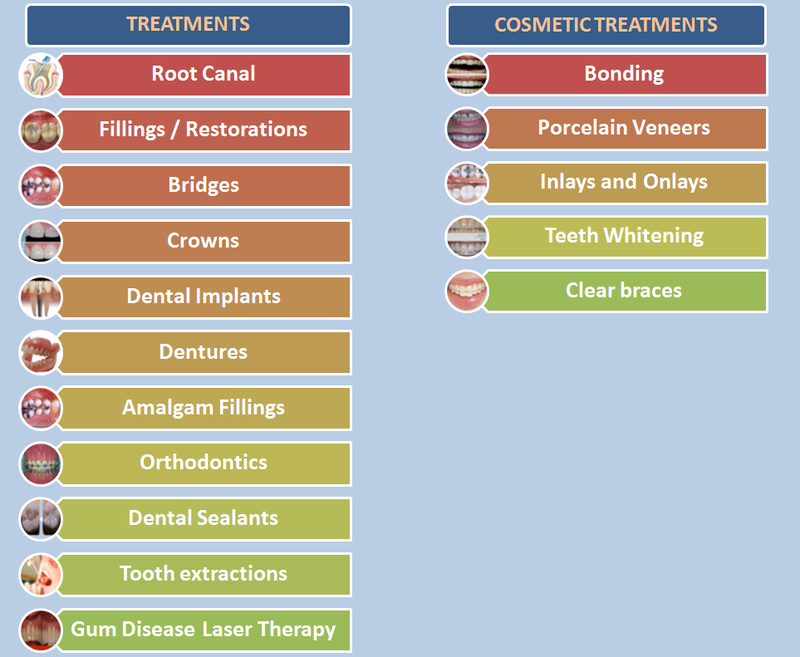 Modern cosmetic dentistry techniques make it easier than ever for you to have a bright, even smile. Click on any of the treatments depicted in the below image to know more about the treatment. 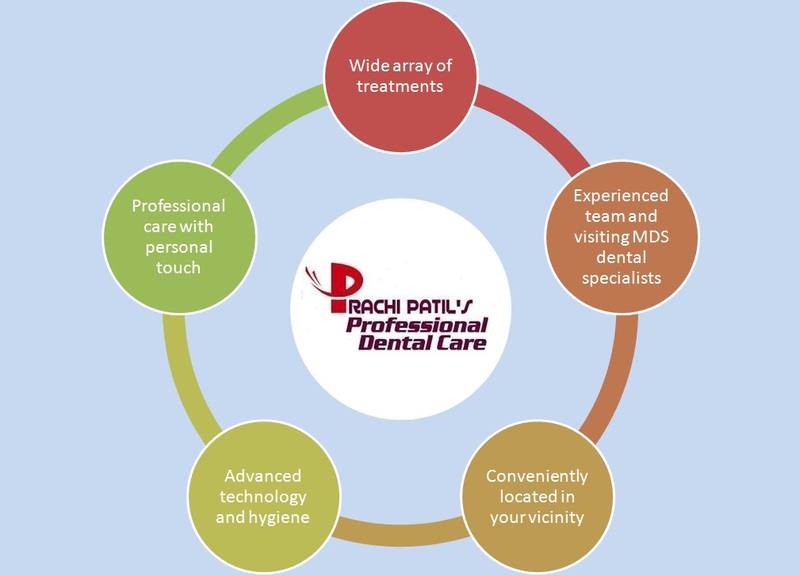 Why you should choose Dr. Prachi Patil's Professional Dental Care? There are multiple reasons why you should choose Dr. Prachi Patil's Professional Dental Care for your dental treatment. Click on any of the bubbles in the below image to know more or choose from the links below. Dr. Prachi Patil's Professional Dental Care practices a full scope of general and cosmetic dentistry with expertise ranging from porcelain veneers to dental implants, crowns and bridges. Dr. Patil can now correct a wide variety of so-called permanent cosmetic dental problems, and can literally redesign your smile. I had three implants done at Prachi Patil's Professional Dental Care. It was very easy and a good job done. The treatment right from putting in the implants till i got my crowns was very well planned. The pain control was excellent and there was no complication what so ever. The healing was also good ..In all I was very happy and comfortable with the whole treatment. Go to the patient testimonials page to view more. Our mission is to create beautiful Healthy Smiles. Our enthusiastic skilled team of specialist dentists will listen to and focus on our patients concerns and desires. As we get to know you as an individual we will provide you with personalized customized care. We desire your visits to be comfortable, safe and efficient. From the moment you walk in the door, you sense the difference. The bright and cheerful decor creates a warm and relaxed atmosphere. It is our intention to create a happy dental home for our patients. Learn more about our dental specialists by visting Our Team page. Please check out our on-going special offers which makes the deal sweeter with our already affordable services. Dental implants are changing the way people live. With them, people are rediscovering the comfort and confidence to eat, speak, laugh and enjoy life. For more information about dental implants or to schedule a consultation appointment, call our office at 020 - 26853040 /09922940024.